At the end of his turn, Cao Ren can flip his card and draw 2+X cards. At the beginning of his next turn, Cao Ren must discard X cards. In both cases, X is the number of weapons in players' equipment areas. If Cao Ren has more hand cards than units of health, he can use his equipped equipment as Negate. 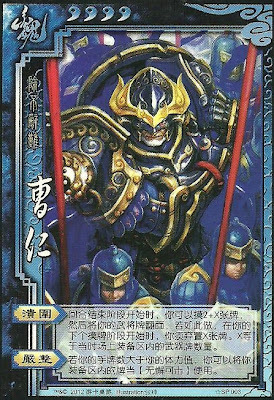 When SP Cao Ren activates "Break Through," he does not discard X cards on the turn in which he flips back face up. Instead, he discards X cards when he takes his actual turn. Note that X is assessed separately when SP Cao Ren initially activates "Break Through" and when SP Cao Ren discards cards at the beginning of his next turn. Note that "Discipline" only allows SP Cao Ren to use equipped equipment cards as Negate. SP Cao Ren cannot use equipment cards in his hand as Negate. "Break Through" may make other characters less likely to pursue SP Cao Ren, as he will have many cards and will be likely to fend off any assaults. "Discipline" works very well with "Break Through" since the number of cards he draws when he activates this ability will make it easier for him to acquire more hand cards than units of health. Additionally, "Discipline" can be used to allow SP Cao Ren to discard his equipped weapon, reducing X and therefore the number of cards he must discard at the beginning of his next turn. "Break Through" must be used with caution. If many players equip weapons after Cao Ren uses this ability, he will lose more cards than he gained with this ability. "Break Through" has the same weakness of the original Cao Ren's "Entrench." This power takes SP Cao Ren out of the game and it becomes more difficult for him to help his team. Cao Pi - Cao Pi's "Exile" can be used to flip SP Cao Ren back to the upright position after he uses "Break Through." Zhang Liao/Zhang He/Bu Lian Shi - These characters have abilities that can sap away SP Cao Ren's hand cards and mitigate the advantage of "Break Through." King SP Cao Ren is not an outstanding king. His powers help to fortify him and keep him alive, but he really needs strong and active loyalists to fight the rebels. 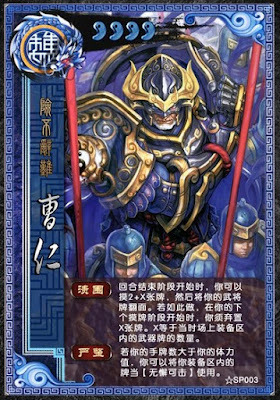 Loyalist SP Cao Ren is a serviceable loyalist under the right conditions. "Discipline" gives SP Cao Ren more Negates to help the king and "Break Through" may help SP Cao Ren acquire more Peaches if necessary. Rebel SP Cao Ren is a serviceable rebel pick, but again, he needs active teammates because his specialty lies in defense, not offense. Spy SP Cao Ren, like the original Cao Ren, is best as a spy. His abilities can be used to protect the weaker team and keep himself alive. It was clear that the original Cao Ren was in desperate need of an update, and SP Cao Ren is certainly stronger. However, this improvement does not seem to be enough to make him an interesting character to use. SP Cao Ren seems to do more outside of his turn than he does during his turn. Be patient when deciding when to activate "Break Through." In general, this ability should be activated when more than half of the remaining characters have weapons, including SP Cao Ren. Before your next turn, be sure to use your weapon as a Negate via "Discipline." The key to using SP Cao Ren is to ensure that X will be greater when the power is activated than it will be when SP Cao Ren takes his next turn.